Overcoming harrowing physical and emotional fears is a vital element of life that people in all circumstances should strive to achieve. The upcoming sports film, ‘Tri,’ is an influential proponent of people conquering their anxieties, as the inspiring story follows a medical technician, who has a history of not finishing things, as she suddenly becomes inspired by a cancer patient who’s for her first Triathlon. To help promote the emotionally-charged drama, actress Kelly Spitko generously sat down for a video interview to discuss her encouraging character of Christy. During the interview, Spitko spoke about taking on the role of Christy at the Paramount Theatre in Boston, where the sports comedy-drama had its world premiere. While talking about ‘Tri,’ the performer revealed that Christy’s a tough athlete who’s in remission from cancer, and she was drawn to showcasing the character’s struggles to retain her physical form that she had before her diagnosis. The actress, who then noted that she instantly knew she wanted to play the role of Christy when she first read the script, which director Jai Jamison wrote with Theodore A. Adams III and Monica Lee Bellais, was also attracted to the physical aspect of the character. While she has been a runner since she was a child, Spitko has never participated in a triathlon before. So while the performer added that filming the race was difficult at times for her, she loved the overall experience. The performer also revealed that she plans on participating in a triathlon in the future, and she appreciates that everyone in the community has supported and encouraged her journey. For those viewers who missed the world premiere of ‘Tri’ in Boston last week, where it won the Indie Spirit Best Story Line Award from the Boston International Film Festival, they have a chance to get another sneak peek of the highly-anticipated sports film tomorrow at 7pm. It will screen at the Angelika Film Center in Fairfax, Virginia, as part of the Northern Virginia International Film and Music Festival. The comedy-drama is then set to be released nationally by Red Zeppelin Productions over the summer. ‘Tri’ follows Natalie (Jensen Jacobs), an ultrasound tech with a history of not finishing things, as she becomes inspired by a cancer patient to sign up for a Triathlon. Natalie is introduced to the strange (and aerodynamic) world of triathletes and meets a colorful cast of characters as she signs up for the Nation’s Triathlon. With the support of her new teammates, she digs deep to discover just how far she can push her mind and body. 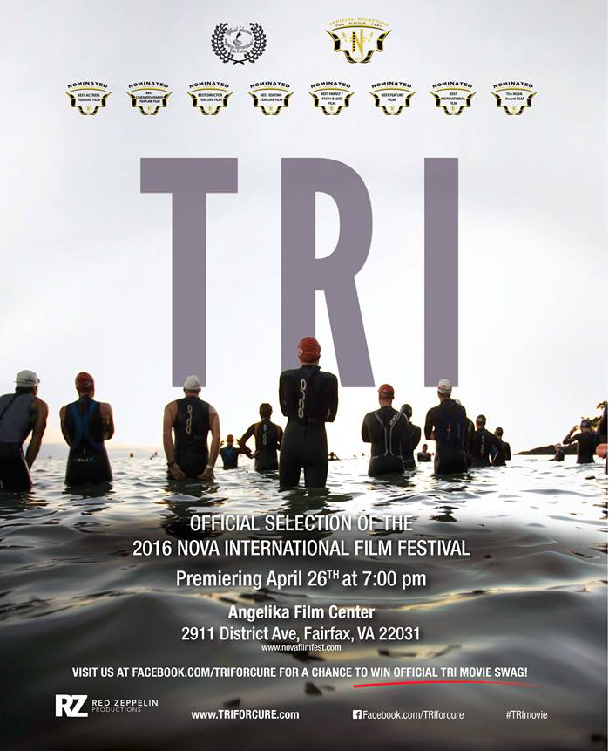 The sports comedy-drama is the first scripted feature narrative about triathlons that has been developed for theatrical release. Triathlon is the fastest growing endurance sport in the world and was the fastest growing of all sports in the UK in 2014. There are over 600,000 athletes registered with USA Triathlon, and over 3.2 million worldwide. Although the film uses triathlon as a backdrop, the niche target market for the film is female runners. Of the roughly 20 million finishers of running events in 2014, 60 percent were women. The concept of ‘Tri’ is to raise awareness and hope for those who are seeking compassion or understanding while dealing with cancer as a caregiver, a patient and a survivor. Watch the video interview with Spitko below. For more information on ‘Tri,’ visit the sport comedy-drama’s official website, as well as its Facebook and Twitter pages.